We had a super windy family portrait session at Baird Point on the University at Buffalo College Campus. Since we were so limited with availability outside of weddings, we were unable to reschedule. We try to make the best of it and go with what ever the weather brings. 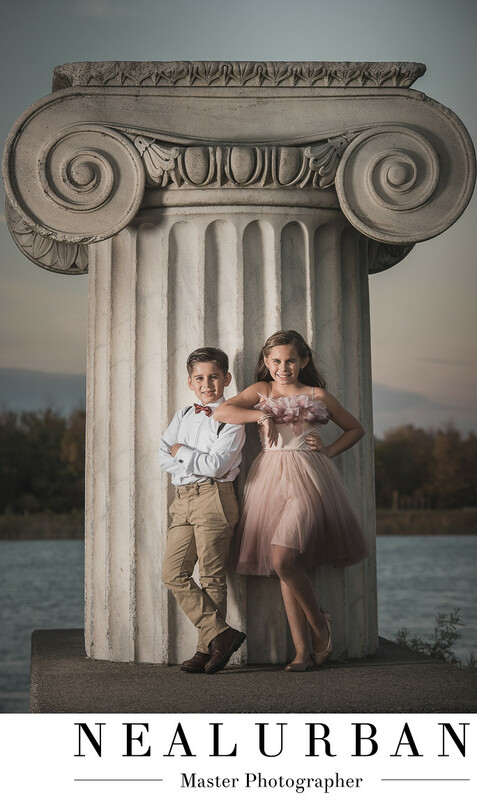 The family told us they wanted to dress up for the portraits, so we wanted the location to fit that style. We sent over photos of Baird Point and they loved the idea! After doing group portraits with everyone, we did some solos. Then we wanted to have brother and sister together for a few photos. They were so cute and had the best smiles! To get up to this pillar, they would need to climb up. At first, we were unsure if it was too high. Before we knew it, both kids were on their way up. These kids had no fear! And boy could they pose! They were having so much fun with this. We let them change up their poses and show us their personalities! The outfits mom picked out were so cute for the kids! We love the suspender look for the little boy and that super girly fun tutu dress was perfect for their daughter! Aside from the wind, this session ending up turning out so good! We used some fun lighting when we needed to and tried tried to keep the posing fun for everyone! Location: Baird Point at University at Buffalo Campus.